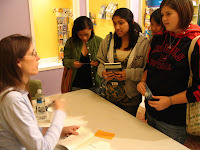 I loved Laurie Halse Anderson for her penetrating voice, her unflinching eye, and the deft way she weaves “dusty” facts into breath-filled action and drama already, but man oh man when I met her in person yesterday, my head almost popped off with glee and my heart grew three times larger for her. Because she is really, really cool. And erudite. And down-to-earth. And smart. And funny. And generous. But more important, she is passionate, and that passion came through as she spoke to our crowd of 20+ about what motivated her to write her young adult titles (Speak, Catalyst, Prom and Twisted), and then discussed her newest National Book Award Finalist novel, Chains. I knew I was going to like Chains before I even started reading it, (and I loved it even more when I finished it), so Laurie’s talk was mostly icing for me. After all, I was already familiar with her historical fiction prowess in Fever 1793. I knew —and was right— there would be shocking (but real!) facts, settings as detailed as any Museum of Natural History diorama (but better! ), and characters who were true to their time but would touch my heart. In every way and then some. But this is more than a good historical fiction novel, and hearing Laurie talk last night hammered this home even more. Chains is an important story about the true pursuit of freedom, and the quest for real liberty for all. It is the story of Isabel, a young slave girl, who is fighting for her own freedom as the Patriots fight for our country’s freedom all around her. It is about the miraculous power of the Declaration of Independence, and what it inspired in everyone who heard it. It is about what our founding fathers and the common people who fought with them succeeded in doing, but it is equally about what they fell short of achieving. It is about fighting against horrific odds and taking risks for what you believe, even if you’re not sure you’ll get to see the outcome. I can’t imagine a better time, really, than right after the history-making election we just had, to read Chains. “We are this close [holds up thumb and forefinger pinching a very small space in the air] to coming to the end of the American Revolution,” Laurie said last night. “We’re almost there.” When you read Chains you’ll understand more about how it all started, and also more of why it’s so important for us to finish the job.